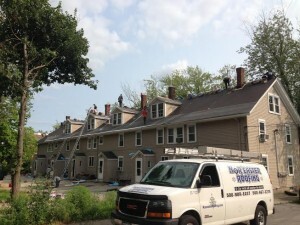 Recent Roofing Services Worcester MA | Nor'easter Roofing Inc. The Nor’easter crew has been busy completing numerous roofing, siding and window installation projects this summer. Featured here is a photo from a recent job, replacing an old roof and installing one much more durable and reliable. Whether it is a home, large apartment complex or anything in between, we have the experience and manpower necessary to ensure that you are left with only the best finished product. It is important to be familiar with a wide range of territories and real estate properties to ensure that the roofing contractor you hire will be able to perform the required tasks in the best way possible and up to the industry’s standards. Our crew travels throughout all Worcester and Middlesex Counties in Massachusetts to install new siding, shingles, windows and now solar panels for both residential and commercial clients. The number of projects we have completed are vast, and we encourage you to take a look at additional photos in our gallery or contact us today for a free quote.